Dr. Ernie Ward investigates the benefits of covered versus uncovered litter boxes. For more from Dr. Ward, find him on Facebook or at www.drernieward.com. Does your cat prefer a covered or uncovered litter box? That is the question veterinary researchers from Ross University School of Veterinary Medicine examined in a study published in the April 2013 issue of the Journal of Feline Medicine and Surgery. The answers they found may surprise you. Inappropriate feline elimination - cats urinating on furniture, rugs, and elsewhere in the house - continues to be a major complaint of cat owners. Urinating outside the litter box is the number one behavioral problem seen by veterinarians and the leading cause of cats being relinquished to shelters. This is a serious and sometimes deadly issue for cats. Even if the issue begins with an infection, the pain associated with urinating may be enough to trigger an aversion to the litter box in the future. The cat connects pain with the litter box and avoids it, resulting in urinating on your sofa. The most common litter box solutions for cat owners experiencing this problem include 1) cleaning the litter box(es) daily, 2) changing the type of litter (unscented, clumping, fine-grained, etc. ), 3) adding litter boxes (the rule of “number of cats plus one” for number of litter boxes), 4) bigger litter box(es), 5) changing location of box(es), and 6) type of litter box (uncovered or covered). Of course, these are only typical suggestions; your veterinarian will provide specific recommendations based on your cat’s problem. The Ross researchers wanted to find out if cats exhibited a preference for open or uncovered boxes versus litter boxes that were covered or “hooded.” They evaluated 28 cats with no history of elimination problems within the previous year. Each cat was given access to two litter boxes during the two-week study period. 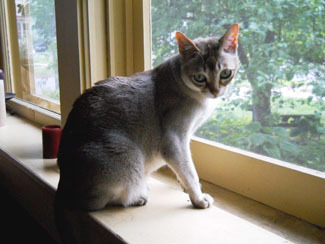 In multi-cat households, the study cats were kept separated from other cats. Owners used the same type of litter and cleaned the boxes daily using the same cleaning regimen. The cats ranged in age from 3 months to 15 years with an average age of 3.1 years. 56% were female and 44% male cats. 78% of the study’s cats were currently using an uncovered litter box and 59% had used a covered box at some point during their life. No cats went outside the litter boxes during the study period. Now it’s time to scoop some poop and get the results. In this study, no overall preference was seen for covered versus uncovered litter boxes. When individual cats were assessed, 70% showed absolutely no preference (i.e. used both boxes equally), 15% used the covered litter box more significantly, while 15% used the uncovered more than the covered. Pretty even results. It seems cats tend to think inside the box - as long as it’s clean. The veterinary researchers concluded that using a large box, cleaning it daily, and using a fine-grain clumping litter were likely the most important litter box factors in preventing many elimination problems. I agree. In my clinical experience, most owners don’t clean the litter box often enough, use smallish boxes, and may place them in locations the cat doesn’t find appealing. I’ve also found that some cats object to scented litter or a litter texture that may feel uncomfortable or displeasing to the individual. This study determined that cats don’t seem to care if their box is covered or not. What they do care about is a clean spot to potty. Have you cleaned your litter boxes today?